DUMBARTON drew 2-2 at Forfar Athletic in their opening group match in the new Betfred League Cup, but lost 5-3 on penalties in the decider for a second point. The Station park side led 1-0 at half time through Josh Peters, who was on trial with Sons in pre-season, but Grant Gallagher headed the visitors level soon after the restart. A Thomas O'Brien goal from distance restored Forfar's lead on 62 minutes, but Dumbarton again levelled seven minutes later from the penalty spot. Garry Fleming converted after David Cox's handling offence in the area (pictured). Sons had a man advantage for a matter of seconds during the game after the home side had Jamie Bain sent off in injury time for a second booking. 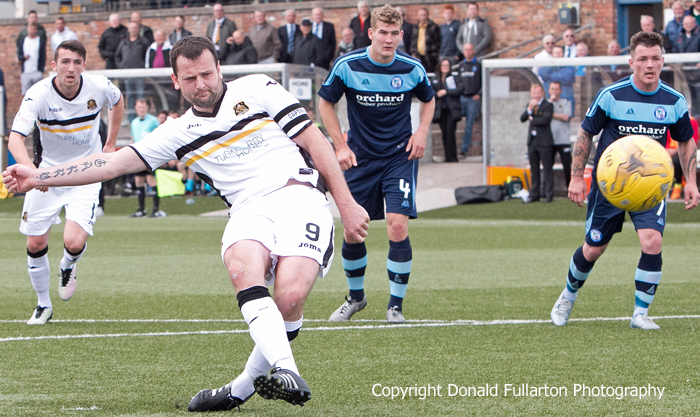 Forfar scored all five of their shootout penalties, while Robert Thomson, Fleming and Ryan Stevenson scored for Sons. Grant Gallagher sent his over the bar. Under the system for this tournament, the sides took a point each for the draw, with Forfar gaining a second point by winning the penalty shootout.